Snooty rich people vs everyone else. It's not the young white kids in college sipping coffee from the locally owned coffee shop. It's not the early 30's couple with their first 'real' jobs who just moved into the Hospital, and it's not lower income or middle income black families in the stabilized apartments. It's landlords, lazy journalism, and insecure, upper class (yes predominantly white), non-contributing consumers who have no neighborhood pride what so ever. Good point about the 77th - I just slotted that in because I wanted to mention it. This whole post was sort of a shambles, and could use some editing. Maybe later in the week . . . I'm an oil derivatives trader (NOT a banker, I don't work for a bank, huge difference) who saved until he was 27 and bought an apartment in a nice, newly renovated accordian style rowhouse on Park Place. I shop locally, am a member of the BBG and the Brooklyn Museum, I drop in at the launchpad and help out how I can, and am glad I can afford to own in a cool, young, diverse neighborhood. I too worry about the consistent building of non-family friendly apartments and wish there were rules like in Prospect Lefferts Gardens. Am I a yuppie scumbag? I don't feel like one but there's certainly an element in this neighborhood that likes to cast dispersions on "new arrivals" (I've been here three years) with a little money. I think there are people in this neighborhood who like to "cast dispersions [sic]" on douchebags who who protest the difference between oil derivatives traders and bankers and who refer to people as "elements" while waving a flag of "I shop local" and "I've been here a whole three years". Let's be honest, how long until you sell your "accordian [sic] style rowhouse" for a big profit and move uptown? Three years? Four? ProCo? HAHAHAHAH. I don't think so. I think publications are always looking for the next "hot new thing" so they report on anything, hoping to get in first. I've read similar things about nearly all parts of Brooklyn, but that doesn't mean it's real. 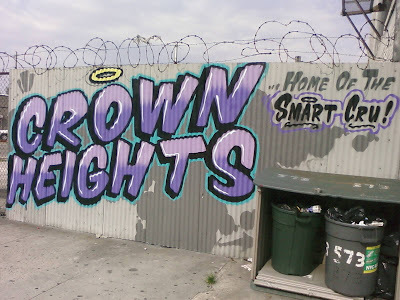 I do think Prospect Heights/Crown Heights is changing, even since I first got here in 2007. However, to me it feels very home grown. The changes are happening from people who live here, not just investors coming in from the outside trying to make a quick buck. We have such a strong community association in CHCA, we also have FAM, LaunchPad, and the new community garden. These are things to be proud of! Let's continue to work to make the neighborhood a better and safer place for the people who live here and care about the community. That's who I want moving in, regardless of race, religion or income. People with neighborhood pride (as Eric put it) who are here for the long run, not just a real estate investment opportunity or some kind of status symbol (the chance to live a shiny condo, cheaply constructed). I think that is a problem in every bigger town. That's why I like smaller towns and even villages, you cannot expect to come even close to the atmosphere and environment these villages have.